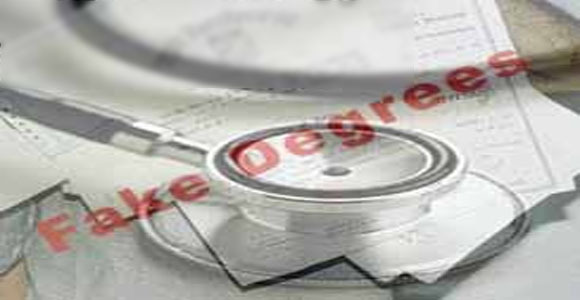 The Pakistan Medical and Dental Council (PM&DC) has so far identified 52 cases of fake medical doctors and cancelled the registration of all while cases have been lodged against 11 fake medical practitioners. Administrator PM&DC Dr Raja Amjad Mehmood at a press conference briefed the media about the important decision made by the council regarding its working and the improvement of private medical colleges. The administrator informed that the PM&DC has been conducting inspections of all medical and dental colleges and pointing out their deficiencies in writing to them to fulfil the requirements as laid down by the council. He said that for the first time in the history of PM&DC, the Auditor General of Pakistan has conducted audit of the council and made 83 observations. The audit has identified financial embezzlement and registration of fake doctors and medical colleges during the period of former Registrar Dr Nadeem Akbar. Inquires are under way by different organisations including PM&DC and National Accountability Bureau (NAB) and the cases against him are in courts too. But he regretted that on every charge the former registrar managed to get stays from the courts, as there is a powerful lobby behind him that is supporting his wrongdoings. There have been many other discrepancies in recognition of medical/dental colleges for which the Ministry of National Regulations and Services has already constituted a three-member panel headed by former Lahore High Court Judge Syed Shabbar Raza for inquiry into the alleged administrative irregularities done by the ex-registrar, especially recognition of 19 medical colleges in a single day. The PM&DC has also directed all the medical colleges to allocate 50 per cent beds for the poor patient free of cost including consultation fee and treatment, simultaneously and 5 per cent quota for non-affording eligible medical students. A module system is also in process to be devised for house job/ foundation year in which BLS course will be mandatory during house job if not done during final year. Assessment exam after completion of house job will also be a requirement to be fulfilled by the institution and the completion certificate shall be issued to the doctors after fulfilment of these requirements. PM&DC is also deciding to re-assess hospitals for recognition of house job as there are many hospitals which do not meet minimum requirements as per criteria of house job training to house officers. Besides, PEMRA and APNS have been given clear-cut directions to ban advertisement promotions of fake doctors and clinics, he added.